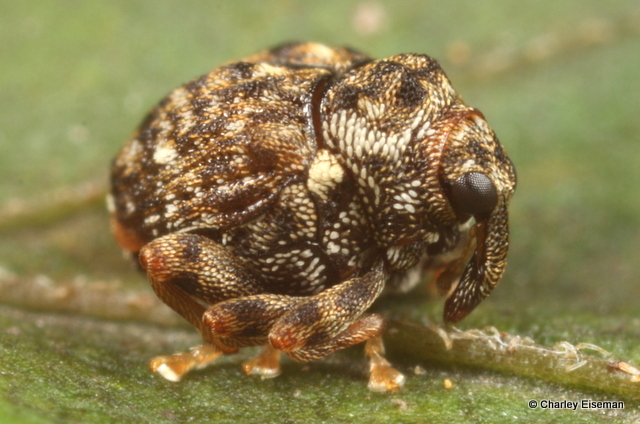 …and a few weeks later they revealed themselves to be adorable little weevils. I explained in my previous post how weevil expert Bob Anderson had identified them as Orchestomerus wickhami, how I wrote up an account of their natural history for my first ever scientific paper, and how shortly afterward Bob informed me that they weren’t O. wickhami after all. I promised I would report back when this was all sorted out, and when I opened the new issue of the Coleopterists Bulletin today, I discovered that that day has arrived. In their review of the genus Orchestomerus*, Hiraku Yoshitake and Bob Anderson have determined that there are four species in North America. A few months after I sent Bob my weevils, he happened to collect a series of O. wickhami adults in Brownsville, Texas, where the type specimen of that species had been collected. When he dissected males from Texas and compared their genitalia with those of mine from Massachusetts, he realized that they were separate species. After examining many specimens from all over the US, Yoshitake and Anderson found that only specimens from the southern tip of Texas represented true O. wickhami, which is associated with sorrelvine (Cissus trifoliata), another member of the grape family (Vitaceae). All other specimens that previously would have been identified as O. wickhami are in fact members of a new species, Orchestomerus eisemani. This is apparently the most common and widespread member of the genus, ranging from Texas and Florida north to Kansas, southern Ohio, and Maryland… and then there is a seemingly disjunct population in Plymouth County, Massachusetts, where I collected those larvae and someone else had caught a female in a malaise trap in 2006. Adults of the other two species have both been associated with grape (Vitis). Orchestomerus whiteheadi is known from southern Arizona and New Mexico. The other species, now known as O. marionis, is named for the type locality: Marion, Massachusetts, which also happens to be in Plymouth County. It has otherwise been collected in Missouri, Indiana, North Carolina, Mississippi, Georgia, and Florida. It has a confusing taxonomic history: Dietz had described O. ulkei in the same 1896 paper in which he described O. wickhami and the genus Orchestomerus. Auleutes marionis was described in 1913 and later synonymized with O. ulkei, but it turns out that the type specimen of O. ulkei was actually a specimen of Auleutes epilobii, a species associated with the evening primrose family (Onagraceae). Auleutes marionis in fact belongs in the genus Orchestomerus, so Yoshitake and Anderson resurrected the name marionis and transferred it to Orchestomerus. I was able to make a last-minute contribution to their study by providing them with some additional specimens Tracy Feldman and I reared from larvae he collected in North Carolina this spring. Two of these are pictured below, in a photo that gives a better sense of their smallness. Although it’s clear that all four species are associated with the grape family, it remains to be determined whether the larvae of the other three are leafminers. So far Orchestomerus eisemani is the only known North American leafminer in the weevil subfamily Ceutorhynchinae. In Europe, two Ceutorhynchus species mine leaves of mustards and related plants. There are many North American Ceutorhynchus species associated with mustards, so there may be some leafminers lurking among them that no one has noticed yet. Added 1/21/2016: Here is a map showing the known distributions of the four Orchestomerus species. * Yoshitake, Hiraku and Robert S. Anderson. 2015. 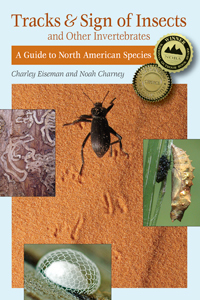 A review of the genus Orchestomerus Dietz (Coleoptera: Curculionidae: Ceutorhynchinae: Cnemogonini) of the USA. The Coleopterists Bulletin 69(4): 565–578. This entry was posted in Uncategorized and tagged Ceutorhynchinae, Coleoptera, Curculionidae, Curculionoidea, larva, leaf mine, new species, Orchestomerus, Orchestomerus eisemani, Parthenocissus, Virginia creeper, Vitaceae. Bookmark the permalink. Congratulations Charlie! I love reading your posts. So cool! And to get all those pieces of the puzzle coming together! Love the great work you do finding those leafminers and other seemingly unnoticed little insects! Congratulations! I know you’ve got many species discoveries under your belt, but is this the first eisemani? And is there any speculation about that strange paired-mining behavior? Do they always mine in pairs? Does anything else? This is the first eisemani… So far the only other species I’ve discovered that have been named are Scolioneura vaccinii and Megaselia nantucketensis (more to come in 2016, though). Based on what I’ve seen so far, this species does normally mine in pairs, and I think it must be because the eggs are normally laid in pairs, though I have yet to find egg remains in the mines. There are some flies that start out with two or more larvae mining side by side from an egg mass, but they all diverge into a blotch mine before too long. 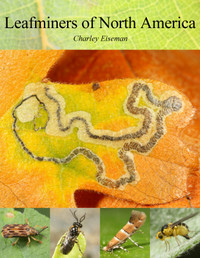 Having now reviewed all the published natural history information I could find for North American leafminers, the behavior of O. eisemani larvae seems to be unique at least on this continent. Very nice! Congratulations. You are doing great work. Thank you for sharing.